Whether you are looking for a starter program to jump-start a sluggish metabolism or your desire is to begin a new, long-term, lifestyle revitalization, Isagenix has a cleanse day program to meet your goal. There are the 9-day kickstart program and the total cleansing and rejuvenating 30-day program. Both program packages include all the products needed to safely detox and nutritionally replenish your body with essential vitamins and minerals. The Isagenix cleansing products only contain natural ingredients. There are no harsh laxatives or artificial chemicals. The success of the program is based on a scientifically developed approach to restore your digestive functions in a manner that invigorates your metabolism, reduces gas and bloating, relieves constant diarrhea or constipation, improves cognitive abilities, increases energy levels, reduce heartburn and acid reflux, and encourages weight loss. That is a long, but not an all-inclusive, list of the benefits you can expect from an Isagenix cleansing program. And, the one final component needed to make your goals fully achievable is you, and your commitment to enhancing your body and mind. Read, plan, and use the daily day planner that comes with your program. It is important to note that you need to schedule no more than two Isagenix cleanse days back-to-back. Interspersing cleanse days with several shake days is a good way to prepare your body for the gentle cleansing action days without a feeling of excessive hunger. Don’t expect overnight improvements. Keep track of your weight loss and measurements on a weekly basis. Share your successes with a close friend or family member. Having someone who supports your efforts is a great motivator. Read all of the instructional materials that come with your cleansing program, plan each week’s meals and snacks in advance, and shop for those healthy foods after you have eaten so that you are not tempted to overbuy. Isagenix 30-day cleansing program also includes several different healthy, carbohydrate and protein filled snacks to boost energy levels and curb your cravings. 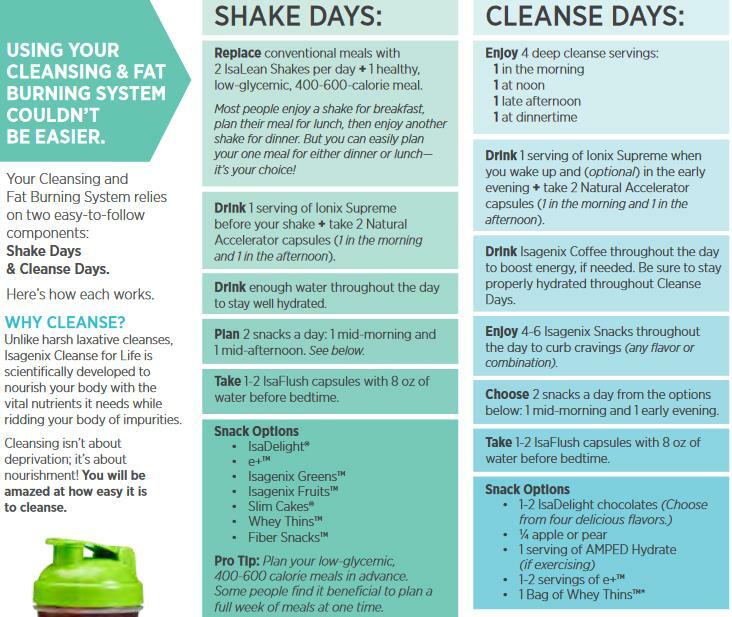 Follow the instructional guide for the daily timetable (below) of when to take Isagenix cleansing products, IsaLean shakes, Isagenix snacks, and other program edibles. With all of your renewed energy, it’ll be easy to keep busy during the cleansing days. If your Isagenix cleanse days are on the weekends, there is always a household chore or an improvement waiting for your attention. To avoid the risk of becoming dehydrated, drink plenty of water. Depending on your weight, you should be drinking 2-4L of water a day. Begin Your Inner Body Cleanse Today! No one intentionally wants to ingest toxins, overload their body with impurities, or encourage their aging process with damaged molecules. And now, with the Isagenix cleansing program of your choice, you can actively reverse those negative effects and begin a whole new, healthy lifestyle approach. No pain, no gain is NOT the Isagenix path to success. The Isagenix model is safe, healthy, progressive improvement that works with your schedule. If you are not satisfied with your 30-day program, for any reason, your purchase comes with a 30-day money back guarantee. You have nothing to lose, except bad habits and excess weight. Remember, if needed, we are here for you to answer any questions and to provide additional support.